4 Robertson Ranch is a premier hunting and special event destination in the rolling hills of North Texas. Jacksboro TX, to be exact. 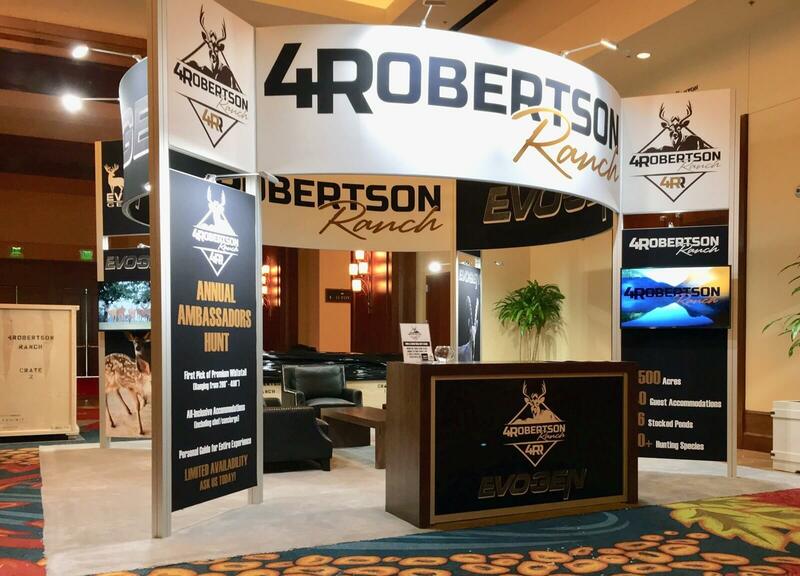 4 Robertson Ranch shared a 20 x 20 booth space with Evolution Genetics at the 2018 Texas Deer Association Convention in San Antonio TX and wanted equal branding for both companies. Both exhibitors desired a “hunting lodge” feel for the booth, and both required significant storage space and a hospitality area to spend time with visitors. The event was held in a hotel ballroom with low ceilings that limited the height of the booth. The most obvious hurdle to overcome was the low ceiling. Exhibit Network was able to accommodate this by reducing the height of an exhibit that 4 Robertson Ranch already possessed. Exhibit Network fabricated a custom Reception Counter with plenty of storage, finished in a rustic woodgrain laminate to achieve the “hunting lodge” look. 4 Robertson Ranch provided the production-ready artwork for all the graphics and their own furniture for the booth. Exhibit Network was hired to produce the graphics, transport the exhibit properties, install, and dismantle the exhibit.